OBJECTIVE: To test whether assistance with the da Vinci surgical system improves the learning curve for a complex minimally invasive (MIS) operation over laparoscopy alone using an ex-vivo model of biliary enteric anastomosis. METHODS: An ex-vivo model for choledocho-jejunostomy (CDJ) was created using specimens of porcine liver that included an intact extrahepatic biliary system and a contiguous loop of proximal intestine. Minimally invasive CDJs were performed by three surgeons with graduated experience in minimally invasive surgery: Surgeon A (MIS and robotic focus); Surgeon B (experienced MIS); Surgeon C (basic MIS). All three surgeons had extensive open surgical experience in CDJ. Each surgeon performed 10 da Vinci robot-assisted and 10 laparoscopy alone CDJs. The primary objective was the learning curve as measured by comparing mean time to completion of the first three versus the last three anastomoses using each technique. The secondary outcome was a comparison of time to complete CDJ between techniques. RESULTS: Surgeon A did not demonstrate a significant learning curve with either the laparoscopic ( 22.4 vs. 22.4 minutes, p=NS) or robotic (24.7 vs 19.8 minutes, p=NS) approach. Surgeon B demonstrated improvement with laparoscopy but it was not significant (46.6 vs. 39.5 minutes, p=NS). However, with robotic assistance, a significant learning curve was demonstrated (36.8, vs. 24.7 minutes, p=0.02) with a plateau in performance – similar to Surgeon A’s – reached after three cases. Surgeon C demonstrated a significant learning curve with laparoscopy (58.3 vs. 33.2 minutes, p=0.004). No improvement was noted with robot assistance (32.2 vs. 34.7 minutes, p=NS). Surgeon A’s mean operative times were equivalent with laparoscopy and robotic techniques (24.5 vs. 22.3 minutes, p=NS). 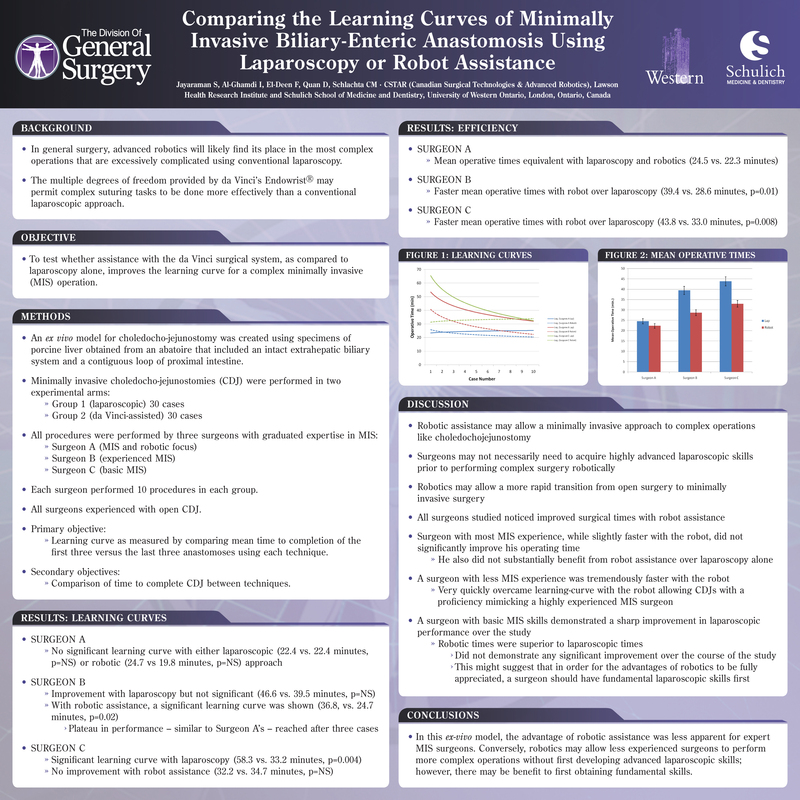 Both Surgeon B and Surgeon C experienced faster mean operative times with robot assistance over laparoscopy alone (39.4 vs. 28.6 minutes, p=0.01; and 43.8 vs. 33.0 minutes, p=0.008 respectively). CONCLUSIONS: In this ex-vivo model, the advantage of robotic assistance was less apparent for expert MIS surgeons. Conversely, robotics may allow less experienced surgeons to perform more complex operations without first developing advanced laparoscopic skills; however, there may be benefit to first obtaining fundamental skills.